Future of Sourcing Digital's series, “Rising Stars of Sourcing,” recognizes individuals newer to the industry whose thought leadership and expertise have shown promise that is likely to have a lasting impact on the industry. We are excited to continue this series with Biswa Panigrahi, who was recently promoted within his organization. 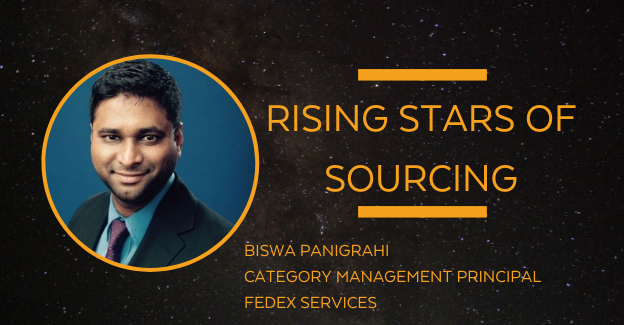 Biswa was recently promoted to Category Management Principal role in Sourcing at FedEx Services. Biswa joined FedEx as a Category Manager II in June 2017 and was responsible for Security and Purchase Transportation categories, focusing on Big Data and emerging technology areas. I started working in the Oil and Gas industry in India after completing my undergraduate degree in Instrumentation Engineering from Indian Institute of Technology in 2009. I spent about six years across engineering, project execution and operations and maintenance, before moving to the United States to pursue my MBA from Ohio State University. My MBA was quite focused on courses from supply chain management, operations and finance. It was during one of the courses known as “Global Sourcing,” that I got an opportunity to work on a student project with FedEx for about four months and I received a lot of exposure into various aspects of category management. I loved the overall experience and was fortunate enough to land a job with FedEx in Sourcing in 2017. It has been a very holistic experience so far in sourcing, which allows me to use all of my skill sets ranging from technology to operations. If you didn’t work in sourcing, what career path would you have chosen? I can think of a few options – maybe I would have continued with core engineering as I still love the field and remember the basics well from my undergrad days. During that time, I was quite focused on robotics and image processing and even have a scientific publication in Recent Advances in Biomedical Engineering (2009). I may have chosen investment banking/corporate M&A as a career as I really developed a keen interest during my business school days in learning all the fundamentals of valuation and financial modeling. Someday, I would love to get more exposure in this area. Alternately, I might have continued with operations since that was essentially what I was doing prior to my MBA – that would have been an easy choice! What do you feel sets you apart as a rising star of sourcing? I think it really boils down to a few simple things. I am very data driven and analytical in my approach, which helps me to simplify complex things or reduce ambiguity. I am also good at navigating myself really well at various communication levels based on required details – knowing when to keep things high level and when to go into the tactical aspects of something. It’s really just about knowing how much detail your audience wants. I am also very good with people – my default behavioral style is “promoting” and I enjoy brainstorming on new ideas or helping people succeed. And I think above all, I am an extremely hard working and optimistic person – I derive my self-confidence from this! Do you have any mentors who have helped you in your career? I have had several mentors throughout my career. I always try to have at least three mentors in every phase of my professional career. For example, currently I have two mentors from FedEx Senior Leadership, with whom I meet once every couple of months. Most of the discussions I have with them are around understanding how to balance short-term and long-term goals. I also have one external mentor to get some outside perspective. What professionally motivates and drives you? When you work for a company such as FedEx, which delivers the Purple Promise to make every FedEx experience outstanding, you develop a deep sense of purpose to do something meaningful every day that generates value for all stakeholders. Can you share any professional goals you’ve set for yourself for 2019 and how you plan to achieve them? I am currently undergoing the CFA program and am targeting Level 2 exam in June 2019, which means numerous hours of study on various financial subjects. I try to set apart 10-15 hours of study time during the weekends – I am still trying to gain momentum here. What do you think will be the big trends in sourcing and procurement this year? I think robotic process automation (RPA) and machine learning/artificial intelligence (AI) are the big technology trends this year, more so from an adoption standpoint. In fact, it’s interesting to note that AI-based RPA is emerging in this space, which should gain a lot of traction in the next couple of years. Blockchain is another emerging trend. Similarly, what or who are the disruptors you think will have the biggest impact on the industry? In terms of impact, I think companies who are early adopters of emerging technologies will have an edge when the technologies are mature for full-scale implementation. What do you enjoy doing in your time outside of the office? I mostly like to read or travel outside of work. I have yet to travel to many places in the United States. What advice do you have for those who are new to the profession or considering entering the industry? Take it slow, learn the basics really well, develop a higher emotional quotient (EQ) to be a people person, be comfortable with ambiguity, be curious and keep learning! Biswa Panigrahi was recently promoted to Category Management Principal role in Sourcing at FedEx Services. Biswa joined FedEx as a Category Manager II in June 2017 and was responsible for Security and Purchase Transportation categories, focusing on Big Data and emerging technology areas. In his new role as the Category Management Principal, he will support the Operations Categories and will advise the Sourcing organization on development and execution of holistic, enterprise-wide category management strategies, including strategic sourcing, supplier relationship management, diversity, and risk management initiatives. Making the World a Better Place…with Procurement?